An Fascismo amo an radikal ngan otoritaryan nga nasyonalista politikal nga idelohiya ngan usa ka corporatista ekonomiya nga idelohiya. An mga pasista natuo nga an nasod o lahi pirmi diri nagkakaarasya nga dun diin an makusog la an mabubuhi ha pagiging makusog, may gamit, ngan pagtindog han ira kalugaringon kontra ha mga magluya. Ginduduso han mga pasista an pagtukod han usa-ka-partido nga estado. Gindidiri han mga gobyerno pasista ngan ginpupugngan an mga pagtipa ha gobyerno ngan kiwa pasista. Gentile, Giovanni. 1932. The Doctrine of Fascism. Enciclopedia Italiana. de Oliveira Salazar, António. 1939. Doctrine and Action: Internal and Foreign Policy of the New Portugal, 1928–1939. Faber and Faber. Mosley, Sir Oswald. 1968. My Life. Nelson Publications. de Rivera, José Antonio Primo. 1971. Textos de Doctrina Politica. Madrid. Blamires, Cyprian. World fascism: a historical encyclopedia, Volume 1. Santa Barbara, California, US: ABC-CLIO, Inc., 2006. De Felice, Renzo. 1977. Interpretations of Fascism. Harvard University Press. ISBN 0-674-45962-8. Kitsikis, Dimitri. 2005. Pour une étude scientifique du fascisme. Ars Magna Editions. ISBN 2-912164-11-7. Kitsikis, Dimitri. 2006. Jean-Jacques Rousseau et les origines françaises du fascisme. Ars Magna Editions. ISBN 2-912164-46-X. Golomb, Jacob; Wistrich, Robert S. 2002. Nietzsche, godfather of fascism? : on the uses and abuses of a philosophy. Princeton, New Jersey: Princeton University Press. Eatwell, Roger. 1996. Fascism: A History. New York: Allen Lane. Nolte, Ernst The Three Faces of Fascism: Action Française, Italian Fascism, National Socialism, translated from the German by Leila Vennewitz, London: Weidenfeld and Nicolson, 1965. Reich, Wilhelm. 1970. The Mass Psychology of Fascism. New York: Farrar, Straus & Giroux. Richman, Sheldon (2008). Fascism. The Concise Encyclopedia of Economics (2nd ed.). Library of Economics and Liberty. ISBN 978-0865976658. OCLC 237794267. http://www.econlib.org/library/Enc/Fascism.html. Seldes, George. 1935. 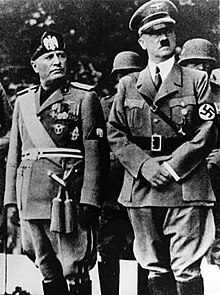 Sawdust Caesar: The Untold History of Mussolini and Fascism. New York and London: Harper and Brothers. Seldes, George. 1943, reprinted 2009. Facts and Fascism. New York: In Fact. ISBN 0-930852-43-5. p. 288. Kallis, Aristotle A., "To Expand or Not to Expand? Territory, Generic Fascism and the Quest for an 'Ideal Fatherland'" Journal of Contemporary History, Vol. 38, No. 2. (Apr., 2003), pp. 237–260. Griffin, Roger. 2000. "Revolution from the Right: Fascism," chapter in David Parker (ed.) Revolutions and the Revolutionary Tradition in the West 1560–1991, Routledge, London. Griffin, Roger. 1991. The Nature of Fascism. New York: St. Martin's Press. Wiktionary, an gawasnon nga pagpurulongan o diksyunaryu. Eternal Fascism: Fourteen Ways of Looking at a Blackshirt - Umberto Eco's list of 14 characteristics of Fascism, originally published 1995. Ini nga pakli kataposan nga ginliwat dida han 14:51, 18 Enero 2015.